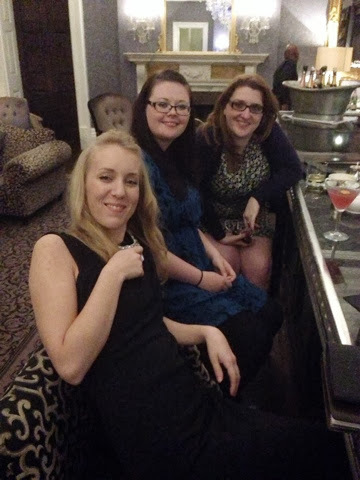 This week's #treatyourselftuesday isn't a beauty review but rather a review of a spa break that I've just been on with my three best friends. We all needed a mini break away for different reasons; celebrating 30th birthdays, a new job, dealing with a bereavement, catch up before a big trip to New Zealand and, in my case, having a little break from baby. 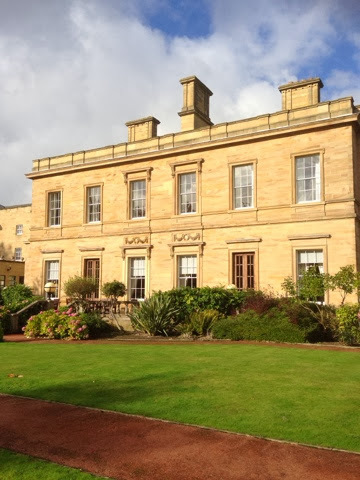 We decided a spa break was in order and found a great deal via Spa Breaks Direct at the rather grand DeVere hotel, Oulton Hall, near Leeds. 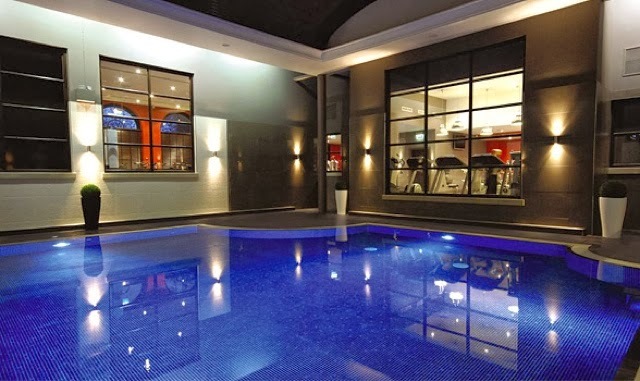 For £99, we had full use of the facilities (steam room, sauna, pool and jacuzzi) for two days, a one hour treatment each (either an aromatherapy massage or a facial), a three course dinner, overnight stay and breakfast. We went Sunday to Monday as I was seeing Travis on Saturday night (who were amazing, as always) and it worked out really well as we could really unwind from our busy week and the hotel was quite quiet on the Sunday night. We had our treatments in turn on Sunday afternoon then popped the champagne whilst getting ready for dinner. 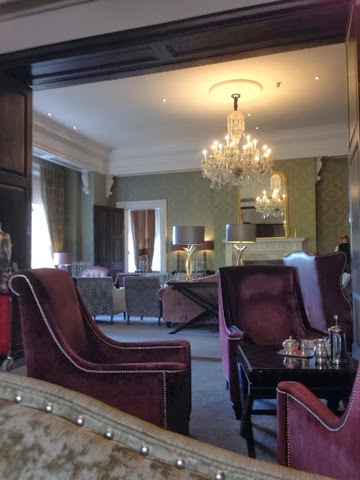 We had a good old chinwag over the delicious meal and enjoyed a drink at the gorgeous champagne bar before heading back to one of our rooms for yet more wine and gossip. My massage was very soothing and she worked on my left shoulder/shoulder blades area and my calf muscles in particular as I had some big knots to contend with. Ouch! Yesterday, we rose and headed to a full on buffet breakfast which had just about anything you'd want to eat and as much of it as you liked. We then made use of the facilities again for a couple of hours, switching from the steam room to the pool and so on until it was time to shower, get dressed and head to afternoon tea in the library. It was a really nice way to spend the weekend and if it wasn't for the travel we all did to get there, we would have spent a little more time unwinding. The facilities were great and the location was really lovely. I felt very clearheaded and chilled yesterday and was so pleased we treated ourselves - personally, I've never had a spa day or weekend and now I'm wondering why! Another big benefit has been the difference in my psoriasis. I was a little concerned by having to wear a swimming costume as my legs are quite badly affected and I have a few patches on my arms and chest that would be visible too, but I just didn't let it bother me. By Monday, my friends were commenting on how my skin did look better and when I got home, I actually noticed quite an improvement. My legs don't look as red and sore and overall, my skin looks smoother. I'm not sure if it's the nourishing oil used in my massage, the immersion in water for a good couple of hours at a time, the effects of the steam room and sauna, the bubbles in the jacuzzi, simple having some time away to relax or a combination of them all, but the improvement to how my psoriasis looks and feels on my body is remarkable. If anyone else has had similar results before, do you know what might be the main cause? If I need to use a sauna regularly then I will if this is how much it helps! So, if you can, find an excuse to get together with your best friends and treat yourselves to a little break - there's some great deals out there and you deserve it! * Note: this isn't a sponsored post, my friends and I booked and paid for our stay - I simply wanted to share my experience with you.